Editor’s Note: “Cheese of the Month” is Cheese Market News’ exclusive profile series exploring various cheese types. Each month, CMN highlights a different cheese in this feature, giving our readers a comprehensive look at production, marketing, sales and in-depth aspects of each profiled cheese type. Please read on to learn about this month’s featured cheese: Curds. MADISON, Wis. — Cheese curds are a beloved snack among many consumers and are growing in popularity in some U.S. regions. Whether fresh or fried, they serve a variety of snackable applications. SQUEAKY, CREAMY, YUMMY — Tillamook in Tillamook, Oregon, recently redesigned its curd packaging to align with the cooperative’s more current brand look and feel. The new packaging also celebrates the product’s attributes — “squeaky, creamy, yummy” ­— so that consumers unfamiliar with cheese curds know what they are getting, according to Tillamook. Typically, cheese curds are made from Cheddar cheese, although they can be made from other cheeses such as Muenster and Brick, according to Mark Johnson, Ph.D., assistant director at the Wisconsin Center for Dairy Research (CDR). Curds made of Cheddar are created through the same process used to make Cheddar cheese, but instead of being formed and pressed into a cheese block, the curds are kept separate. In addition, all curds — no matter what cheese variety they are made from — must be produced using milled curd. Cheddar curds typically are higher in moisture than Cheddar, and they are salted right away, Johnson says. While curds do not have a standard of identity, curds with “Cheddar” on their labels must abide by FDA’s federal regulations for Cheddar cheese, he adds. Curds usually are served fresh or breaded. When curds are breaded, a coating — such as a starch solution — typically is applied to the outside of each curd so that the crumbs and spices stick before the curds are frozen and fried, Johnson says. Fresh curds are known for producing a squeak. According to a CDR study in which Johnson was involved, the protein in a fresh curd — casein — is tightly knit, connected by a high number of calcium phosphate molecules. As teeth bite into the cheese, they compress the protein network and cause it to resist and rebound, creating the characteristic squeak. As cheese ages, the acid in the cheese from the cheesemaking process slowly breaks down the calcium phosphate bonds, meaning the cheese eventually loses its squeak, the study says. In addition, proteolysis — the breakdown of protein — begins to occur because the rennet added during the cheesemaking process “attacks” protein, Johnson says. This breakdown eventually changes the structure in the cheese, which also causes the cheese to lose its squeak, he says. However, the squeak typically can be restored when the curds are refrigerated for up to two weeks and then heated for 15 seconds in the microwave, according to the CDR study. The study also examined frozen curds, freezing them for up to three months. The curd’s squeak returned after the curd was frozen for up to three months and refrigerated for up to an additional two weeks, and then heated up for 15 seconds in the microwave. Warming the cheese in these situations forces the protein molecules to interact more closely, recreating the curd’s ability to squeak, the study says. Annual cheese curd volume retail sales were at 5.1 million pounds in the latest 52 weeks as of July 9, 2017, which was down 2.1 percent from last year (total U.S. multi-outlet and convenience stores, fixed weight only), according to data from Information Resources Inc. (IRI)courtesy of Dairy Management Inc. Total U.S. sales, however, grew each year from 2013 to 2016. Prices of cheese curds fluctuate throughout the year and were up 3 percent in July from a year ago, with an average price of $7.52 per pound, according to the IRI data. When looking at cheese curd volume sales over eight national geographic locations, the Great Lakes region sells the most, accounting for 59 percent. This is followed by the Plains region. Meanwhile, California and the West show the most growth, according to the data. Cheddar is the top cheese curd variety sold in both U.S. multi-outlet and convenience stores, with Mozzarella and Farmer cheese varieties also placing high in multi-outlet stores and Monterey Jack ranking high in convenience stores (fixed weight only, latest 52 weeks as of July 16, 2017), the data says. In addition, plain curds have a 70-percent share of volume sales, with the top flavors falling mostly along the hot profile, according to IRI. Cheese curds especially see an increase in retail sales around the Fourth of July holiday, with other spikes occurring during Labor Day, Thanksgiving and Christmas holidays as well as Super Bowl Sunday, according to the data. Various cooperatives and companies offer curds but take different approaches to selling the cheese. Ellsworth Cooperative Creamery, Ellsworth, Wisconsin, carries both flavored and unflavored Cheddar cheese curds. In its own retail stores, Ellsworth experiments with different varieties and package sizes. It also distributes curds for retail in Plain, Cajun, Taco, Garlic and Hot Buffalo in 1-pound, 2-ounce and 5-ounce sizes; and, for foodservice, it conducts direct distribution, shipping whichever curd flavors the customer orders in 5- and 40-pound packages, says Paul Bauer, CEO, Ellsworth Cooperative Creamery. Its curds are sold to customers in all 50 states as well as internationally. Ellsworth Cooperative Creamery’s curds were a significant factor in the Wisconsin governor recognizing the Village of Ellsworth as the “Cheese Curd Capital of Wisconsin” in the early 1980s, and to this day the cooperative strives to continually innovate its curds. Starting as a butter and powder plant before stepping into cheese production, Ellsworth’s curds now continue to grow in popularity. The cooperative works with consultants on staff to help ensure its curd flavor profiles and characteristics meet customer needs. It also strives to maintain a process that produces a clean- and fresh-flavored curd that allows for a shelf life of six or more months, Bauer says, noting that the curds maintain their squeak in this time with a little care, although the squeak is always best in a fresh curd. “We’re trying to be innovative within our field and with our product,” Bauer says. At Arena Cheese Inc. in Arena, Wisconsin, the company offers traditional, handmade Cheddar curds with a shelf life lasting just days. While unflavored is the company’s most popular curd variety, it also offers flavors such as Garlic and Herb, Dill, Vegetable, Cajun and Buffalo Wing, along with other customized flavors for customers, says Bill Hanson, vice president, Arena Cheese. The company offers curds in 12-ounce retail packs and does bulk sales in bags between 10 and 20 pounds. The company’s marketing strategy is built around freshness and, as such, its curd sales are very localized, Hanson says. The curds, made daily Monday through Friday, are mainly available in Arena Cheese’s retail store and are sold through local farmers markets and a couple of other distribution channels that offer fresh curds. Arena’s curds are a small portion of the business; Hanson notes that the company’s intent for its curds is to help bring more people into its cheese store. The company’s curds are handmade and labor intensive, and producing larger volumes would require the company to invest more in the process, Hanson says. 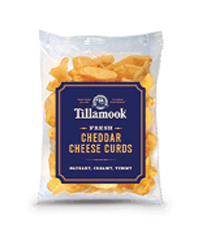 Meanwhile, Tillamook in Tillamook, Oregon, offers unbreaded yellow and white Cheddar curds that are made fresh in small batches several times per week, according to Abby Kempf, assistant category manager, Tillamook. Its curds are sold in Tillamook and are available for online purchase. “Curds are best consumed fresh to get that signature ‘squeak,’” Kempf says. Whether fresh or fried, cheese curds have many utilizations. Curds, when fresh, traditionally are served as a snack, Hanson says. Exemplifying curds’ easy snackability, he says Arena Cheese staff and customers joke that the customer will need to buy two bags, because one bag will be eaten on their way home. Similarly, Kempf notes that Tillamook’s cheese curd consumption has grown over the past several years, due in part to their alignment with snacking trends. In addition, she says Tillamook staff suggest topping tomato soup with a few curds or coating them in tempura batter and frying them before serving with chipotle ranch. A Tillamook cheesemaker also suggests sprinkling curds with dill to make them extra savory, Kempf adds. Bauer notes that Ellsworth’s curds are expected to become ingredients in other products, such as smoked brats and pizza applications. At the end of July and into early August, Ellsworth conducted its first production run of breaded cheese curds using Hot Buffalo, Bold Buttermilk and Beer Battered flavors, which went “very well,” Bauer says. With Ellsworth’s primary targets for this product being restaurants and foodservice chains, the cooperative distributed the curds during the first full week of August. “We’re always looking to keep inventing new ways to meet our customers’ needs,” Bauer says.